I'll choose lemonade, even though I'm sure I'd tire of it (or whatever else I selected) eventually. Sorry for boring you, Pat. Your blog has been so awesome lately. It's impossible to compete with content like yours so I don't even try. Now that Pat is just a plain fun hater. This is a fascinating "what if" scenario. My pick? Coffee. But my religious commitments of 15ish years require that I refrain (and I do) so go figure. I would bet, however, that if there were only two beverages available (water and coffee), the religious requirements would become obsolete. I'm banking on that. I'm also banking on the fact that there will be coffee in heaven. Oh and did you really read that Catching Fire book? Sometimes plain water tastes incredible. Sometimes I get nauseated drinking it. A nice flavor option is Nuun. It adds no calories, and they offer several flavors. Which is good for times when water gets boring but you still want to try and drop lbs. I'm tempted to go with a hot drink, so maybe my new affection for Pero (can I still use creamers? )would suffice. But really, it's hard to just not say Diet Coke. I mean, other than my morning mocoffee (Mormon Coffee) I pretty much just drink water and DC anyway. Does Dwight harass you during your work day the way he does Jim? Rabidrunner, I'm with you on the coffee. The evolution of those religious requirements are a peculiar thing, but I won't delve into it here. I haven't yet read Catching Fire, but I listened to a science friday interview with the author. It's third or fourth in my book queue. The premise is an intriguing one. The calculator I've had for 11 years now, and it's only on its second set of batteries. I find it surprising that you noticed the calculator but nobody's mentioned my Dwight Schrute bobblehead. 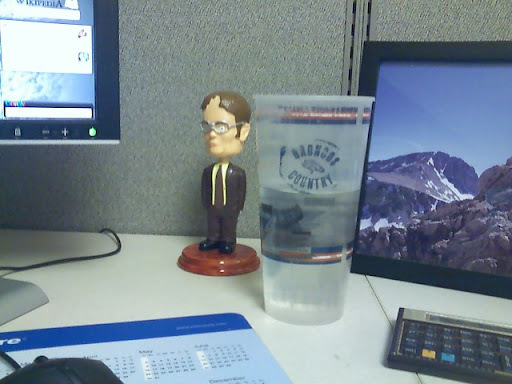 Adam, I spoke too soon about nobody noticing the Dwight bobblehead. No, he doesn't harass me. He's assigned to be my bodyguard and dutifully never leaves his post. If coffee/pero/whatever is your choice, cream doesn't count as an additional beverage. If I were Amazon, I'd suggest that those who like mocoffee may also like motea. The tazo decaf chai latte concentrate you can get at the grocery store is tasty. Not exactly calorie free, but tasty. Bring a mug in the morning--I'll bring a thermos with some to share. OK seriously? No one is going to pick an alcoholic beverage? Really? Are you guys freaking kidding me? Gin Martini. Boodles gin. 8-1 gin-vermouth ratio. Gin stored in freezer. Glass interior misted with vermouth, then sub-32F gin poured onto side (inside obviously) of glass while slowly rotating glass to mix. No shaking, or excessive stirring, and NO ICE. The gin must never encounter water- it is like Superman and green kryptonite. Again- NO ICE. Finally, add 1 or 2 olives, preferably either empty (i.e. no pimentos- that's cheesy) or, if you must stuff your olives- with garlic cloves. Ah screw it- I'm doing a post with an Awesome Graphic. This is too important to just leave in a comment... Oh, and NO ICE. I'm keeping this thread going in hopes of a 3rd comment from pat t cakes. i would totally say beer or coffee, but you said i could only choose ONE. i'm not filling my water bottles with beer, i don't want coffee after a 50 mile ride in july. so, if i can only have ONE, it's gotta be diet coke with lime. dug, really? Diet Coke is not surprising, but with lime? I find it refreshing on occasion, but I'd have to opt for the original if I could have just one. I can confirm the stuff about kidney stones. I have had more than one doctor tell me that women who have experienced both kidney stones and have given birth say that the kidney stones were much worse. Water is my beverage of choice right now as I'm trying to pass a stone from New Years Eve day. I ended up going to the ER, nearly blacking out from the worst pain of my life. This one was far worse than the others I have experienced. It was so bad I was shaking and convulsing from the pain and almost bad enough to wish I was dead... almost. That is, until the IV pain drugs kicked in. Chocolate Milk. It's the recovery drink of champions and the thought of post-workout indulgence gets me out the door. It's also much less expensive than some crappy mix you have to hold your nose closed to get down. Daren, that's the recovery drink of choice for Kristin Armstrong as well. But what does she know--she's just reigning world champion and olympic gold medalist.